With a Yellow Calla Lily. 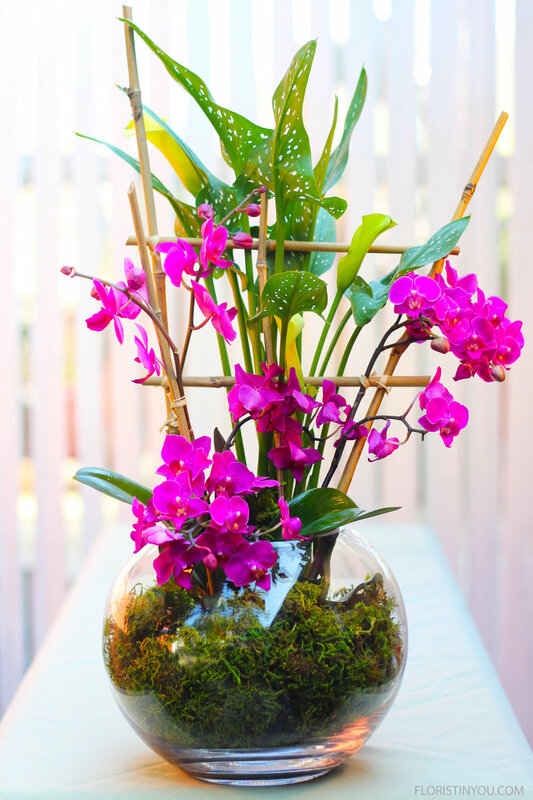 For this dramatic presentation of Mini Phalaenopsis Orchids and Calla Lilies you will use an 8 inch bubble bowl lined with lots of Sphagnum Moss. You can buy a vase like this (click here) This is a stunning presentation for a display table or entry room. In this tutorial you will also learn how to cut and tie a bamboo lattice. Incidentally, the name phalaenopsis comes from Latin. 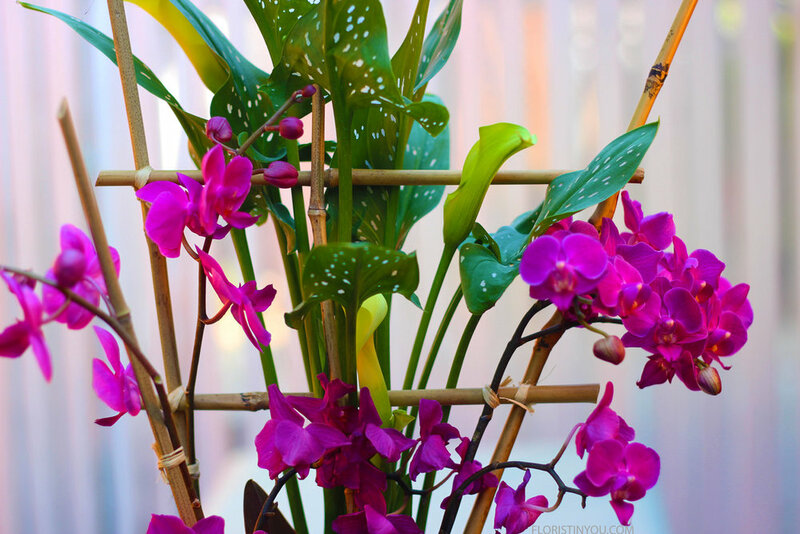 'Phal' means moth and 'opsis' means appearance. The orchids look like moths in flight. The name Calla in Calla Lilies is Greek for beautiful. 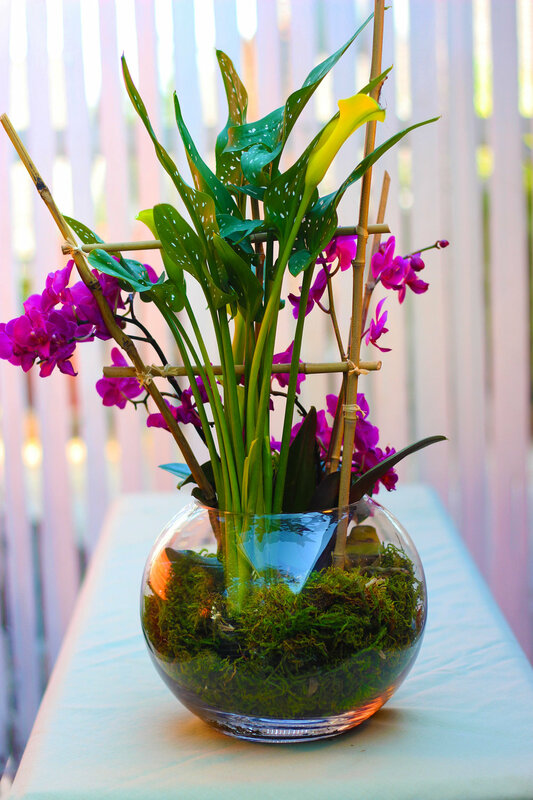 If you have your 2 orchid doubles, your Calla lily, moss and bubble bowl, we are ready to roll. Push moss up against inside 'walls' of bubble bowl. Replace lily liner with orchid size liner (or same size cup with holes in bottom). Place in back. Spray leaves only of orchids. (Spray outside). Place 1st orchid front right. Hold 1st orchid to side. Place 2nd orchid front left. Measure with your eye the length of bamboo for right side (about 19 inches). Measure with your eye length for bamboo for left side (about 21 inches). If you break on orchid stem, no worries. Put it in a water vial and place near bottom. Cut 2 cross pieces (about 10.5 and 9 inches). Tie tight double knot. Trim close. Cut bamboo pieces to support all stems. 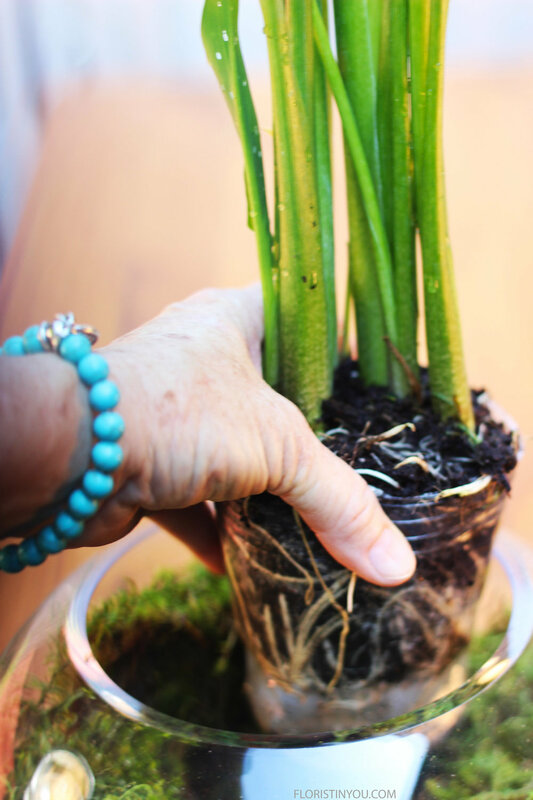 Tie each orchid stem to bamboo with raffia. Double knot. Trim close. Cover any liner or vial with moss. Here's a detail shot. I love the spotted lily leaves.